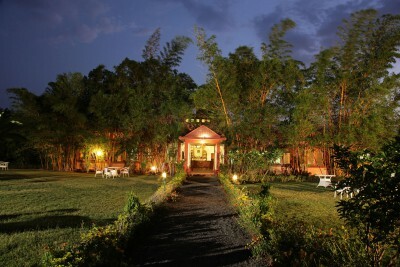 Tadoba National Park, also called Tadoba Andhari Tiger Project, is the oldest national park in the state of Maharashtra. It comprises 623 sq km of assorted meadows, lakes and dense mixed forests of bamboo and teak, home to large populations of spotted deer, sambar deer, wild boar and antelopes such as the nilgai and the very rare four-horned antelope. Carnivores such as leopard, sloth bear, wild dog and jungle cat are seen here regularly: however, the reserve is primarily the domain of the Bengal tiger. The tiger population has surged in recent years from a population of around 40 in the 1990s to a present day adult population of almost 70. The birth of around 30 new cubs over the last year is testament to the health of the reserve and bodes well for the future tiger population here and throughout the whole of India. There are a number of waterholes situated around the park which attract tigers and other wildlife during the dry months of October to June, with particularly good chances of sightings when bamboo and other vegetation shed their leaves from January onwards. May and June are particularly hot months (40C and above) when tigers spend most of the daylight hours wallowing, affording excellent sightings if you can bear the heat. The reserve is very much off the mainstream tourist radar and is served by only a couple of quality lodges, meaning very few foreign tourists venture here. A few domestic tourists arrive at weekends and holidays; at other times it can often feel like you have the park to yourselves.